Two houses on the Isle of Wight have been wrecked in a fire. 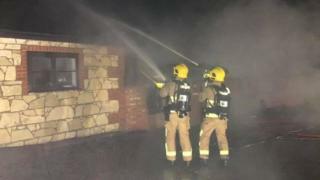 Crews were called to the bungalows in Bunts Hill, Porchfield, near Newtown, just after 19:00 GMT on Saturday. One of the properties was completely destroyed while the other suffered damage to the roof. Firefighters from three stations were called to tackle the blaze, which was out shortly after 21:00. The fire service said no one was injured.